Postcard: Hanging Rock — A Trysting Place. And murmuring dove were in Matilija. Bring a sigh as a memory travels back. NOTE: Hanging Rock was covered by Lake Matilija when Matilija Dam was built in the 1940s. Where do young couples go to tryst now that Hanging Rock is gone? At the end of this article is, “NOTE: Hanging Rock was covered by Lake Matilija when Matilija Dam was built in the 1940s.” I’m not sure that this is an accurate statement. My father (Harold C. Mashburn/deceased) told me that he used to go to Hanging Rock when he was a youngster to swim in the creek. Dad told me that Hanging Rock was demolished in order to build the dam. If I recall correctly, I think Dad said that Hanging Rock was removed with explosives. I hope Dad was incorrect. Wouldn’t it be great to see Hanging Rock still there when Matilija Dam is removed? As Matilija reservoir slowly filled with water in 1948-1952, a Ventura County landmark was submerged. 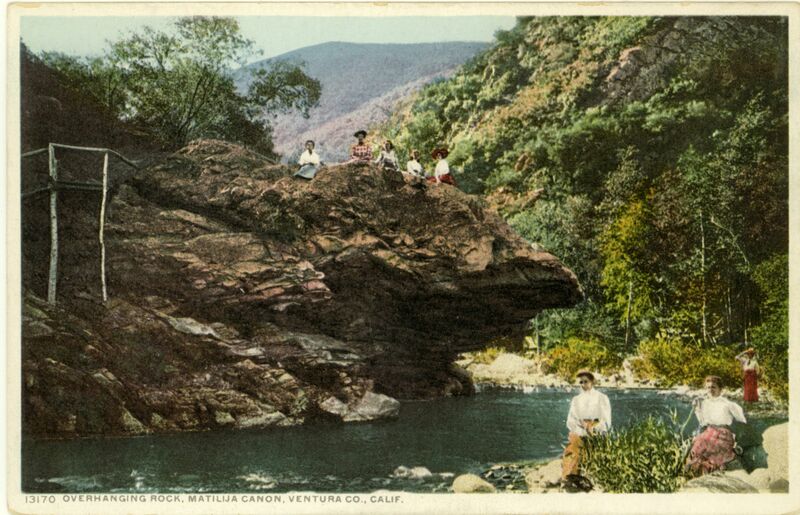 The Hanging Rock of Matilija Canyon, also referred to as Overhanging or Leaning Rock, was enjoyed for decades by residents and visitors to the resort at Matilija Hot Springs, located closely downstream. Historical photos reveal that Hanging Rock survived the blasting necessary for construction of the dam, and it now lies deeply buried beneath a half-century of fine silt deposits near the dam. Hanging Rock will one day be resurrected as sediment is removed for the deconstruction of Matilija Dam, and future generations will again be able to enjoy this historical landmark. I saw this picture in sepia tones on some website a few years back. Until today, I didn’t realize exactly where it was located. Thanks all for informing me. My question is: after 50 plus years of being underwater, will it still be intact ? It would be nice if that Dam could be torn down before it falls down and hurts a lot of people. I also don’t know why there has to be so much money spent on this subject. Just start notching it down, and let the silt spill over little by little. Why are some people making this removal so expensive ?! I have no memory of “The Springs” as it was called but my older brothers do. My Grandparents Charlie and Molly Rowe owned The Springs when it was condemed by the county for the construction of the dam. My parents and brothers lived there and had to walk down the canyon to the main road where Ojala was to take the bus to school. Craig…….you wrote that “historical photos reveal that Hanging Rock survivedthe blasting necessary for construction of the dam…”. When I was the Park Ranger stationed at Matilija Lake Park, part of my duties were to make patrols of the lake area. There’s a gated dirt road that leads from Matilija Canyon Road to the dam. I used to drive down it to the dam where I used to catch lots of swimmers and fishermen that had illegally entered the closed area. Many of these swimmers and fishermen would be on top of a jagged sandstone outcropping that’s only a few yards from the dam and is bordered by the lake. I’m wondering if this sandstone outcropping could be the top of Hanging Rock. Would you know? Is there a way that I might see the “historical photos” to which you refer? I was just quoting the “Matilija Coalition”, so I’m not sure what photos they are referring to. When I get some time, I’ll try to look into this further. There was once a small cabin resort in the area called Lyon Springs Resort. Will post some photos of it soon. I was the last “County of Ventura” Park Ranger to ever be stationed at Matilija Lake Park. That’s because the campgrounds and picnic sites were demolished by major flooding in 1978. I lived in the Park Ranger Residence in the park from Aug. 24, 1974 to Feb. 10, 1978. The campgrounds, picnic sites and residence were all located up-canyon from the lake. There were two campgrounds (which included picnic sites). Campground No. 1 was located on the opposite side of Matilija Creek from Matilija Canyon Road. Campground No. 2 (and the Park Ranger Residence) was located about a 1/4-mile up-canyon from Campground No. 1. It was located between Matilija Canyon Road and Matilija Creek. There is nothing left of Campground No. 2. It’s all riverbed at present. About half of Campground No. 1 still exists. After the Ventura County Parks Department gave up their lease to the property, the property was converted to the “Matilija Environmental Science Area” (Aka: M.E.S.A.). There used to be an old, abandoned dirt road that led from Campground No. 1 to a flat area that was at the base of the mountains that are across Matilija Creek from Matilija Canyon Road. Locals used to call this flat area “Deserpa Flats”. Supposedly, it was named after a “Doc Deserpa”. Also, I’ve been told that this flat area is where Lyon Springs Resort was located. Indeed, there are some old concrete foundations there. When I was a boy in the 1950’s, I used to climb on top of a huge boulder that was located on the bank of this flat area and fish from it because Matilija Lake almost completely encircled it. The boulder is still there. A former Park Ranger (John Steen = deceased) that lived in the Park Ranger Residence a few years before me told me that he found sections of the dirt road, I mentioned above, further up the canyon. Steen told me that the road sections were completely covered with brush. He also told me that he thought this was the original road that ran up the canyon. In 1937-38 and 39 Our family spent two week vacations in a Dr. friend of my dad’s who had a cabin home in Lyon Springs and as a boy I learned to swim at the pool located down a long dusty road which had a store and rented cabins. On one occasion my dad was one of those who literally pulled the plug on the pool for cleaning. This cabin was set on large plot of land which had a BBQ area called the Pig pen and the home itself was situated over a small creek which ran under the front porch. The entrance opened up into a large living space with a large loft perched over it and was accessed to by a pull down ladder. The room was filled with stuffed animals and a large bear rug on it’s floor. Small kitchen was located in the rear. My dad’s name is the same as mine and was Mgr. Title Insurance and Trust Co In Santa Barbara. Charming. Lovely poem, plus I always liked the word Matilija.